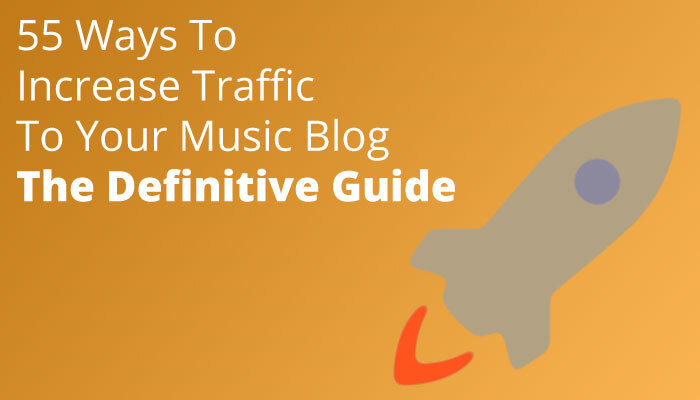 Is driving traffic to a music blog exactly the same as any other blog, or are there some special considerations worth bearing in mind? As far as tactics go, you can basically use the same ones. I believe this is reflected in the tips found in this guide. Music is a popular topic, and if you hit the right vein, you can get a lot of attention from musicians, music fans, or even the general population. But that’s also what makes it so competitive. There are lots of people writing about music already. From reviews to music marketing to resources for musicians, you will find bloggers catering to a variety of different niches. That’s why I create content around a niche I call music entrepreneurship. My unverified theory being that, while there are lots of experts covering the topic of marketing, there aren’t that many covering people skills and business practices in connection with building a music career. Time will tell whether I’m right or wrong. Still, in much the same manner, you’ll want to find a unique niche, differentiate yourself, find an angle, or develop an original voice in your space. Ultimately, this is why the strategy and mindset pieces are so important. Let’s take a look at what it means to write for different types of audiences, and what you should bear in mind if you want to create a successful blog that appeals to those specific readers. If you want to write content for the general population, you should recognize that there are many major publications already covering generic music news and tabloids (online and off), and some of them aren’t even music-specific publishers. This isn’t to say that you can’t bring your own unique perspective to the news items receiving coverage. However, if you want to build your blog on press clippings, it will put you in the position of constantly having to break news, and this can be hard to do, because it will require you to stay up-to-date and to be searching for newsworthy items all the time. If that sounds exciting to you, then maybe you’ve found a match for yourself. Relevance, controversy and timeliness will be your mantra. This isn’t to say that there aren’t other approaches, but if you want to appeal to a broader audience, you have to think about what the average person cares about, which is often sensationalism and gossip. If you want people to come to you for their fill of daily or weekly news, you need to create a compelling reason for them to come to your blog. You’ll want to bring a unique voice to the topic, and do what others aren’t already doing. I have been writing for musicians for nearly 10 years, and in general I have not found engagement to be great. I keep an eye on others who are in similar niches, and I think they would agree. Musicians will come to read your posts or listen to your podcast, and they may even get something out of it, but they may not necessarily share your content or comment on it. The good news is that – over the long haul – you can still develop a relationship with your audience, and you can still build your email list, create products, offer your services, and so on. If you know musicians in your community and can find ways to feature them on your blog, then it’s definitely worth leveraging your network. Something you should know about musicians is that the vocal minority can be pretty blunt, but if you’re used to YouTube and Reddit comments, you shouldn’t be thrown for a loop. If you want to write for musicians, recognize that there are plenty of general music marketing blogs out there already. You may want to delve a little deeper into specific topics, or maybe partner with developers to create a tool that solves a problem and blog about that. From aspiring promoters to independent studio engineers, there are many other niches you can get into as a blogger. Some of the best opportunities out there are likely to be in these smaller markets. If there’s no one else catering to them, you could potentially be the first. Of course, you still have to take the time to evaluate your opportunities. Sometimes, competition just shows you that there’s a real market out there, and that it could withstand the addition of another blog. Other times, it shows you that there are enough experts talking about the subject already. Don’t get stuck in analysis paralysis when choosing what topic to talk about on your blog. When I started my website, I had to take a chance. There were no guarantees. If you were to ask other blog owners, you would likely find the same thing. Some people do spend a lot of time in market research and strategizing before launching their blog. However, if they got their blog off the ground, they clearly didn’t stay there. If you haven’t started you blog, or you haven’t chosen your topic yet, you shouldn’t stay in research mode forever either. Take a chance, bring it to the market, and continue to tweak as you go. Spin it off into something new or different if you don’t get it right the first time around. We know that there’s always room to improve upon this guide. Nevertheless, we hope that you have benefited from this information, and would love to hear your thoughts on it. What did you think? How could we make this a better resource for you? Send us an email and let us know!